When a young woman linked to a list of missing Fire-Sky tribal members commits suicide, Pueblo Police Sergeant Nicky Matthews is assigned to the case. As the evidence leads her to a shocking discovery, she uncovers not only murder but a motive with an ominous, vengeful twist that strikes at the very core of what it means to be a member of the Fire-Sky People. With an intimate knowledge of Fire-Sky customs and traditions, the killer ensures the spirits of those targeted will wander lost forever. As Nicky closes in on the murderer, those closest to her are put in jeopardy. She realizes she must be willing to sacrifice everything–her career, her life, and even her soul–to save the people she is sworn to protect. I hope readers will come away a little breathless and with a smile of enjoyment. It was a fun book to write. I learned so much during my research of the Native American Pueblo cultures of New Mexico, I wanted to share that in some small way. I didn’t set out to write a Southwestern Mystery, but that’s what it became. I remember thinking as I finished it that it might fit with works by Tony and Anne Hillerman/Margaret Coel/Aimee and David Thurlo, and started looking online for ways to present and market it. That’s when I found the Tony Hillerman Prize, submitted–and won in 2017. HEARTS OF THE MISSING is a mystery (murder), it is set on a fictional New Mexico Pueblo (I had members of the Laguna Pueblo read and suggest changes), and it contains a female protagonist in law enforcement. I added a dash of the supernatural and a scoop of molecular genetics to boot. I have a long way to go before my name can be added to the list above, but it is a goal for which I will strive. Yes, but it is integral to the plot, so I won’t give it away. I can say it has to do with the traditions of some of the Pueblo cultures in New Mexico. However, I would like to be like my protagonist, Nicky, in HOTM. While she needs to know and understand the culture she works in to do her job, she is still an outsider and respects the boundaries of Pueblo traditions. I, too, wish to respect those boundaries. There is an element of the supernatural in HOTM that I didn’t make up–it’s true. I have a contact who works on a New Mexico Native American Pueblo and she has actually experienced some of the encounters you will read about in the book! And just like Nicky, it wasn’t until she began to work on the Pueblo that she began to experience these encounters. When I first heard these ghost stories is when I began to formulate HOTM because I loved the deliciously creepy feeling I got when she told them. And I have quite a few more that I am weaving into future books. Douglas Preston and Lincoln Child. I love their books. I love the mixture of science and action and thrills. I get lost in their books. When I first started reading them, I got so obsessed, I was almost happy when I’d bought the last one on the bookshelf. Now that HOTM is being published, I have introduced P&C audiobooks to my husband. New Mexico is a very large state, so whenever we travel, we have Preston and Child audiobooks playing. When I started writing mystery/thrillers, they are who I looked to. HOTM is less of a thriller and more of a mystery, but I learned a lot about how they write tension and action, and have used those lessons (hopefully) in my books. A biochemistry professor at New Mexico State University, Carol decided to write books for something to do after her kids went off to adulthood. 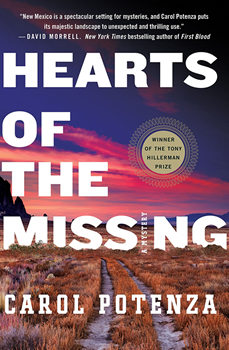 HEARTS OF THE MISSING is her debut novel and won the Tony Hillerman Prize in 2017. She keeps busy teaching biochemistry and writing the next book in the Nicky Matthews series, which will always include (1) science twisted into science ‘fiction’, (2) some paranormal because a number of her relatives are ‘sensitive’ (she is not) and have GREAT ghost stories that she weaves into the fabric of her books, and–of course–(3) murder. 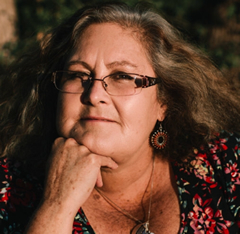 To learn more about Carol, please visit her website.